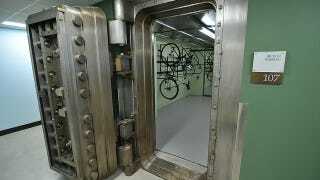 The Spalding Building in Portland, Oregon is a historic office building that has one of the coolest parking spots for bicycles: an old school bank vault complete with a 16,000 pound door. I'd feel pretty good about putting my bike there. I bow to this door.